At Marshall’s Creek Wellness Center we frequently welcome both children and parents to the office for regular chiropractic adjustments. In fact, Dr. Anne Marie has a post-doctoral degree in chiropractic pediatrics, which focuses on the chiropractic care of children from the time they are born and through their teenage years. Today, we want to extend just a few friendly reminders to help keep your kids’ backs healthy and feeling great throughout the school year. Instilling good backpack habits now will help your child’s back develop properly throughout adolescence without excess school-related pain. If your child does start complaining about back problems, head over to Marshall Creek Wellness Center. Back pain in children and teens should be taken seriously, especially if it does not subside after a day or two. Our wellness center is happy to provide chiropractic adjustments to kids and teens. Click here to schedule your appointment. With that said, let’s get into some backpack tips to make sure “Back To School” season goes off without a hitch! Make sure the backpack has two straps – and use them. We probably all did this as kids, and now our kids do it too. Hanging a backpack off of one shoulder is one of the worst things you can do to your back. Make sure your kids use both straps to help evenly distribute the weight. When all the weight is on one side, it can cause painful muscle strains for your kids. It’s called a backpack – not a buttpack. At some point, it becomes “cool” to lengthen the straps of your backpack as much as possible so it hangs below your bottom. Encourage your children to keep their straps tightened so their backpack rests where it belongs – at their back. Keep it light. Spend an evening with your kid going through their backpack and making sure that they really need everything in there. If there are books or supplies they can leave at school, encourage them to do so. If their backpack is loaded down with books they haven’t used in months, they might want to leave them at home. If it has to be heavy, use a waist strap. Many backpacks come with smaller waist and chest straps attached to the shoulder straps. Buckling these straps can help to evenly distribute weight on your kid’s core and chest, rather than only on their back. Get the right size of backpack for your child. When choosing a backpack, take into consideration that backpacks are not one-size-fits-all. Small children should have small backpacks that are not wider than the width of their body or longer than their torso. The bigger the backpack, the more stuff they’ll fill it with, and the heavier it will become. Have good homework posture: This isn’t directly related to a backpack, but encouraging your kids to have good posture while doing homework can help prevent back pain as well. For example, if your kid likes to lay in bed and do homework, suggest that they move to a desk or the kitchen table instead. The last thing we want is for kids to unintentionally hurt or strain their backs because of their heavy backpacks. 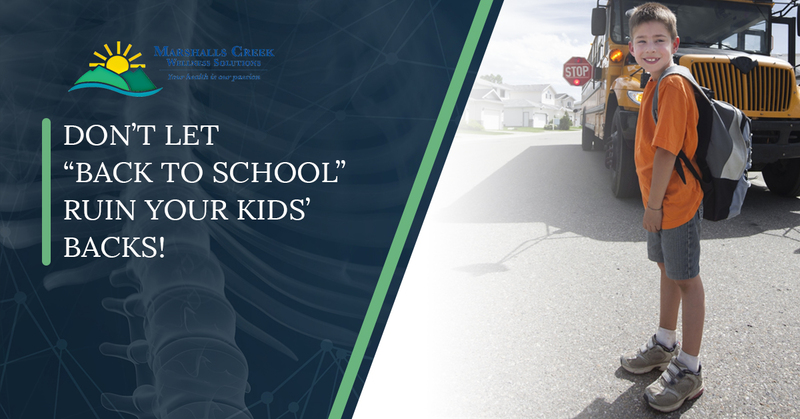 Following the tips above will help keep your children in tip-top shape throughout the school year, reduce the risk of injury, and keep them comfortable and ready to go to school. These tips don’t only apply to the beginning of the school year. If spring break rolls around and your child’s backpack looks more like a sack of potatoes than a bookbag, take action. Additionally, encourage your children to talk to you about any pain they are experiencing. If they do experience pain, schedule a wellness appointment with our chiropractors at Marshall’s Creek. Our experienced doctors can offer advice on how to prevent further pain, as well as show you some stretches and exercises to do at home to keep your kids moving. Contact us today to schedule a pediatric chiropractic appointment!